After over a year’s wait, the Pyro is getting a new set of tools. The biggest update for Team Fortress 2 in some time, the Jungle Inferno update not only adds new maps, taunts, campaign contracts, and balance changes, but a new suite of class weapons for everyone’s favorite firebug. 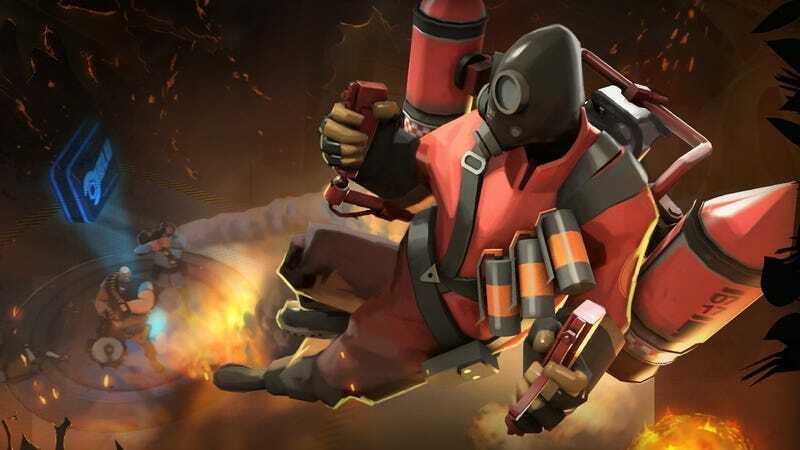 In 2016's Meet Your Match, the Pyro beat the Heavy to get a full-fledged class pack in a future update, and as community members have noted, the wait has been over 400 days. The big note is a jetpack, a new secondary which lets you take to the air and deal heavy falling damage to anyone you land on. You can also douse enemies with the gas can, slap enemies with the hot hand, or use the new single-shot flamethrower. The Pyro ends up feeling a lot more mobile with its newfound airborne abilities, as shown in this gif from from Reddit user oCrapaCreeper. The Pyro also gets a few much-needed tune-ups to their class. Hit detection for airblast has been made a consistent cone and given more reasonable attributes, making the extinguishing gush a little more reliable. Alongside new flamethrower particles and some updates to the afterburn flames, it’s a good time to be a Pyro. The update is live now on Steam.